In this vicinity the Union cavalryman, Gregg, guarding army trains moving to Petersburg, was attacked by Wade Hampton, June 24,1864. Gregg was driven back toward Charles City Courthouse, but the wagon trains crossed the James safely. This action closed the cavalry campaign that began at Trevillians, June 11-12, 1864. Benjamin Harrison (1726 -1791)-Virginia planter, politician, and signer of the Declaration of Independence-was born at nearby Berkeley plantation. He first served in the Virginia House of Burgesses in 1752, though elected in 1749, and remained in office until 1775. In 1774, the Virginia Revolutionary Convention sent Harrison to the Continental Congress, where he served through 1777. 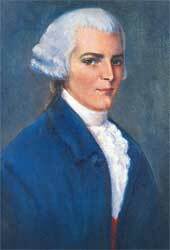 He was Speaker of the Virginia House of Delegates from 1778 to 1781 and governor of Virginia from 1781 to 1784. His son William Henry Harrison and great-grandson Benjamin Harrison were presidents of the United States. A short distance south, it was first settled in 1619 when the first Thanksgiving was held here. The present mansion, built in 1726, was the birthplace of Benjamin Harrison, signer of the Declaration of Independence and President William Henry Harrison. 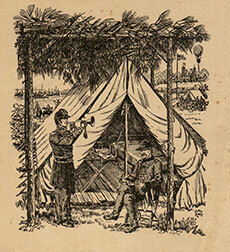 During July and August, 1862, it was the headquarters of General McClellan. The bugle call “Taps” was composed here then by General Butterfield. Charles City County, named for King Charles I, was one of Virginia’s eight original shires formed by 1634. It encompassed land south of the James River until 1702, when, when Prince George County was established. The courthouse was completed here in 1757. On 8 Jan. 1781, during the Revolutionary War, a British detachment under Lt. Col. John G. Simcoe surprised and dispersed an American militia unit stationed here. During the Civil War, Union forces passed through in 1862, 1863, and 1864, and many county records were destroyed. On 13 Dec. 1863 Union cavalrymen captured dozens of Confederates garrisoned here. Originally part of William Byrd’s Westover, Evelynton has been occupied by the Ruffin family since 1847, when it was purchased by Edmund Ruffin, Jr. Fierce skirmishes took place on the property during the 1862 Peninsula Campaign. Confederate troops were led by generals J. E. B. Stuart and James Longstreet. The breastworks are still visible near the house. The dwelling and dependencies of the plantation were much damaged during the fighting. The Georgian-Revival house, built on the foundation of an earlier structure, was designed by noted architect, Duncan Lee, in 1935. On 4 Dec. 1619, Capt. John Woodlief, a member of the Virginia Company, arrived aboard the ship Margaret with 35 men to take charge of Berkeley Hundred. An experienced former Jamestown settler, he became Berkeley’s first governor. He bore instructions that the day of his ship’s arrival “be yearly and perpetually kept holy as a day of thanksgiving to almighty God.” Beginning in 1958, the Virginia First Thanksgiving Festival commemorated this directive as the first English Thanksgiving in North America with an annual reenactment at nearby Berkeley Plantation. South of here, on a bluff overlooking the James River, stands the half-mile-long Fort Pocahontas, built in the spring of 1864 by Union soldiers during the Civil War. The fort protected Union vessels on the river and guarded the landing at Wilson’s Wharf. Commanded by Brig. Gen. Edward A. Wild and manned by the 1st and 10th Regiments of U.S. Colored Troops and two guns of Battery M, 3d N. Y .Light Artillery, the 1,500-man garrison beat back assaults by 2,500 cavalrymen under Confederate Maj. Gen. Fitzhugh Lee on 24 May 1864. It was the only Civil War battle in Virginia in which nearly all the Union troops were black. In mid-June 1864, Grant abandoned his works at Cold Harbor and marched to Petersburg, a vital rail center. A mile south of here, at Willcox Wharf (now Lawrence Lewis, Jr., Park), steamboats ferried the troops and wagons of two corps across the James River on 14-15 June. Three miles downstream, at Weyanoke Point, Union engineers built a 700-yard-long pontoon bridge in seven hours on 14 June. For three days parts of two corps, as well as supply, ammunition, and ambulance wagons, crossed the bridge in a column 50 miles long. Engineers then dismantled the bridge. Grant’s attack on the Confederate lines at Petersburg failed, and the armies settled into a ten-month siege. John Tyler, tenth president of the United States, was born just north of here at Greenway on 29 March 1790. The frame plantation house was built ca. 1776 for his father, John Tyler, a noted jurist and governor of Virginia (1808-1811), who is buried on the property. The future president grew up at Greenway and lived here again during the 1820s while serving in the Virginia House of Delegates, as Governor of Virginia, and in the United States Senate. He and his wife, Letitia Christian, moved to Gloucester County at the end of the decade. In 1842, during his presidential term, Tyler bought Sherwood Forest, about three miles east of here. Located 1 ½ miles south on the James River is Kennon’s Landing. Richard Kennon married Anne Hunt about 1735 and lived there until his death in 1761. Anne Hunt’s father was Captain William Hunt whose father William Hunt, a supporter of Nathaniel Bacon, is buried directly across the bay at Bachelor Point. The colonial government of Virginia opened a tobacco warehouse and inspection station at the landing in 1742. Hogsheads of tobacco were weighed, inspected for quality, and stored for shipment there. During the Revolutionary War, on 4 Jan 1781, American-turned-British Gen. Benedict Arnold landed some of his troops at Kennon’s and others at Westover, then marched to Richmond. A mile and a half northwest, Lott Cary was born in slavery about 1780. In 1804 his owner, John Bowry, a Methodist minister, hired him out to a Richmond tobacco firm. Cary joined the First Baptist Church in 1807. He purchased his freedom and became a Baptist minister in 1813, then founded the African Missionary Society in 1815. Cary sailed for Africa in 1821 as the continent’s first African-American missionary. He established Providence Baptist Church in Monrovia, Liberia, and several schools. As a political and military leader, Cary helped Liberia survive as a colony of free American blacks. He died there in November 1828. Three miles south is North Bend, a Greek Revival residence built in 1819. Sarah Minge, sister of President William Henry Harrison, and her husband, John, built the original portion of the house located on Kittiewan Creek. Thomas H. Willcox greatly enlarged the dwelling in 1853. General Sheridan established his Union headquarters here while his 30,000 men crossed the James River on a pontoon bridge at Weyanoke. Located nearby was the main town of the Paspahegh Indians, tributaries to paramount chief Powhatan. When Jamestown was built in their territory, the Paspahegh consistently resisted the English settlement. In Aug. 1610, George Percy, on orders from Gov. De La Warr (Delaware), destroyed the Paspahegh town and its crops, killing 16 people and capturing the wife and children of chief Wowinchapuncke. On their return to Delaware’s ship, the English threw the children overboard and then shot them in the head, and later executed the chief’s wife — actions that changed the nature of warfare for the Virginia Indians. Wowinchapuncke was killed in a later skirmish near Jamestown. The remaining Paspahegh left the area by 1611. Eight miles west on “The Old Main Road” is Piney Grove. The original portion, built ca.1800 on Southall’s Plantation, is a rare survival of Tidewater log architecture. Edmund Archer Saunders, a successful Richmond businessman, operated a store at Piney Grove between 1857 and 1874 when he sold it to Thomas Harwood. Saunders later returned to Charles City County and purchased Upper Shirley and Weyanoke plantations. Harwood enlarged the building for his home in 1910. During the 18th century this property was established as a Southall family seat. Notable family members include James Barrett Southall, owner of Williamsburg’s Raleigh Tavern, Turner Southall, member of the committee to build the Virginia State Capitol, and historian Douglas Southall Freeman. Furneau Southall built the original log portion of the structure on his 300-acre plantation before 1800. During the 1780s, Southall’s, now known as Piney Grove, was home to Furneau Southall’s family and at least 17 slaves. He was a grandson of family patriarch John Southall and served on the county Committee of Safety with John Tyler and Benjamin Harrison. Just to the south is Sherwood Forest, where President John Tyler lived after his retirement from the presidency until his death in 1862. He bought the place in 1842 and came to it as his home in March, 1845. Here Tyler, with his young second wife, entertained much and raised another large family. The house, well-furnished, was damaged in the war period, 1862-65. This church, four miles north, was used as a field hospital, June, 1864, following the action at Nance’s Shop, where the Union cavalryman Gregg, guarding a wagon train, was attacked by Wade Hampton. Gregg was driven from the field but saved the wagons. Wounded soldiers were brought to the church and some of the dead were buried there. John Tyler purchased this plantation one mile west in his native Charles City in 1842 while serving as tenth president of the United States, and made it his home from 1845 until his death in 1862. Tyler lengthened the wooden 18th-century house to over 300 feet long, thereby creating the longest frame house in America. Before becoming president, Tyler had served Virginia as congressman, governor, U.S. senator and vice-president. He served as president of the Washington Peace Conference in Feb. 1861; both sides occupied his Sherwood Forest property during the Civil War. Sherwood Forest, a National Historic Landmark, remains the home of Tyler’s descendants. The house is a short distance south. Shirley was first occupied in 1613 and was known as West-and-Shirley Hundred. In 1664, Edward Hill patented the place, which was left by the third Edward Hill to his sister, Elizabeth.Carter, in 1720. Here was born Anne Hill Carter, mother of Robert E. Lee, who often visited Shirley. The present house was built about 1740. In 1617, Opechancanough, Chief Powhatan’ s younger brother, gave land to the south to future governor Capt. George Yeardley. Yeardley patented it and a portion became Upper Weyanoke, a James River plantation. Archaeological investigations there revealed an almost unbroken succession of settlements from the late 17th century to the late 19th century. On the grounds is a Greek Revival dwelling completed by 1859 for Robert Douthat. During the Civil War, about 14 June 1864 a pontoon bridge was constructed at Weyanoke Point across the James River for portions of Union Lt. Gen. Ulysses S. Grant’s army. Upper Weyanoke was added to the Virginia Landmarks Register and the National Register of Historic Places in 1980. In 1619 the first settlement was made at Westover, about two miles southeast. Two settlers died in the Powhatan uprising of 1622. Theodorick Bland bought Westover in 1666;William Byrd I acquired it in l688. About 1730 his son, Colonel William Byrd II, built the present house, which exemplifies the high level of architectural quality attained during the colonial era. In January 1781 the British army under General Charles Cornwallis crossed the James River at Westover in pursuit of the Marquis de Lafayette. A short distance south is Westover Church. It was first built on the James River near Westover House early in the eighteenth century. About 1730 the site was changed and the present building erected. Defaced in the Campaign of 1862, the church was reopened for worship in 1867.